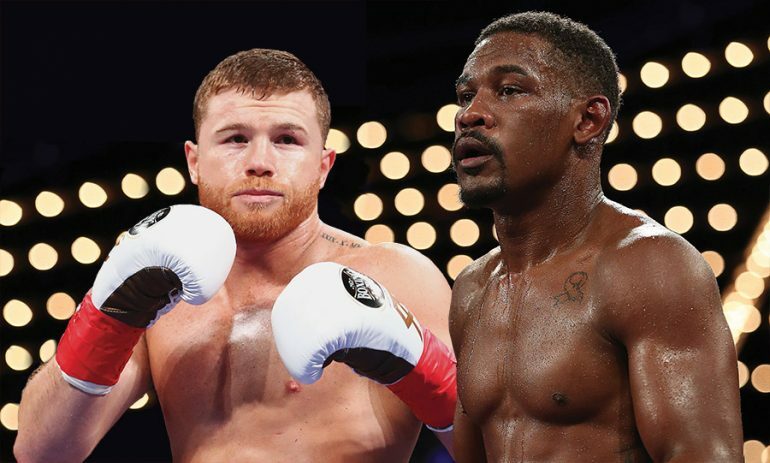 The fight to unify three of the four major middleweight titles has a home after it was announced that the Saul “Canelo” Alvarez-Daniel Jacobs bout on May 4 will take place at the T-Mobile Arena in Las Vegas. Alvarez (50-1-2, 34 knockouts) is putting the WBC and WBA belts, plus his Ring magazine championship, at stake, while Jacobs (35-2, 29 KOs) raises the IBF title he won in his last fight with a split decision over Sergiy Derevyanchenko in October. The fight will be broadcasted on DAZN in the United States. Ticket and undercard information will be announced “shortly,” according to a press release. Alvarez had shown in his previous fight, a three-round drubbing of Rocky Fielding in December, that he can draw in New York also, bringing in a sell-out crowd of 20,113. For the Jacobs fight, Alvarez is returning to a venue where he has competed four times prior, including his two fights against Gennady Golovkin. “I want it so when people talk about T-Mobile Arena, they say that is where Canelo Alvarez fights,” Alvarez was quoted. Jacobs of Brownsville, Brooklyn, N.Y. has fought in Las Vegas seven times, including his pro debut in 2007, but hasn’t fought in Sin City since 2010, when he was stopped in five by Dmitry Pirog. Six of his last seven fights had taken place in the state of New York, and he’s won his last three straight after a close, competitive decision loss to Golovkin. “Scheduling the biggest fight of my career at T-Mobile Arena is the perfect occasion to return to the bright lights and shine on a massive stage. Canelo is a champion and he’s fought the best so it’s an honor for me to face him, and of course it’s a brilliant fight for the fans,” said Jacobs. While Alvarez and Jacobs both have deals with DAZN, they’re represented by different promoters, with Alvarez under Golden Boy Promotions and Jacobs with Matchroom USA.